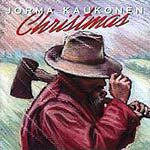 CD review: "Christmas with Jorma Kaukonen"
This is one of those real funky Christmas albums that works because of its nontraditional approach; place it alongside your Leon Redbone and "Austin Rhythm and Blues Christmas" holiday CDs. Jorma Kaukonen, best known as guitarist for Jefferson Airplane and Hot Tuna, has always been more attuned to the blues than rock, and this new Christmas album reflects that  from the opening acoustic blues of "Downhill Sleigh Ride" to the rocking Delta mud of "Christmas Blues." Nontraditional it may be, but it's still very much in the vein of the Christmas spirit  perfect for sitting in front of a low fire with a few friends and a warming beverage, chasing through holiday carols with some blues thrown in for leavening. The highlight is "Christmas Rule," a hilarious, romping blues about Santa's sleigh getting shot down by a too-high Christmas Eve fire, with the not-so-jolly bearded one showing up at the front door in a foul mood demanding the keys to Jorma's pickup in order to finish his deliveries. Hey  can't do the traditional thing? Treat yourself and get this album. It may be the best Christmas present you ever give yourself.